Microsoft has announced that Happy Wars, the 15 v 15 multiplayer action game revealed at last year's Tokyo Game Show, will be free to download for Xbox Live Gold members. The platform holder has resisted the free-to-play movement up until now, but Happy Wars represents the first of what will no doubt become a growing roster of freemium modelled titles. In the game you'll engage in “exciting castle siege and magic spell battle action for madcap free-for-all battles in fantasy world settings,” drawn in an attractive cartoony style. Most importantly, details of the in-game purchases are yet to be revealed, beyond “lavishly rendered” in-game items made available through an item shop. It will be interesting to see how this builds. Happy Wars is out in Autumn 2012. I wonder how many achievements I can milk out of it without having to pay. Toylogic has announced the release date for Xbox Live Arcade’s first ever free-to-play title, Happy Wars. A large-scale multiplayer action game capable of hosting up to 30 players at once, Happy Wars will be free to download for all Xbox Live Gold members. It’s got a cutesy art style too. “Gamers from around the world will be able to join together in exciting castle sieges and spell slinging, madcap free-for-all battles in a variety of fantastic settings,” says the blurb. I'm a sucker for castle sieging. Count me in. The Development and Management Teams for Happy Wars have determined that due to production of Xbox 360 units and related services and support coming to an end, continuing development and operations for Happy Wars on Xbox 360 will be difficult. Regarding the Windows 10 version of Happy Wars, every effort has been made to improve the cross-play functionality between Windows 10 and Xbox One versions. However, we have been unable to reach the desired results. As we do not expect any dramatic improvements in the reasonably near future, we will be closing down the Windows 10 version of Happy Wars as well. We are deeply grateful for your support of Happy Wars over the years. 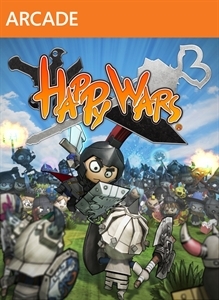 It has been 5 years since Happy Wars first released on the Xbox 360 in October of 2012. It’s been a wonderful run, and we would like to thank all of our fans, supporters and players who have been with us through it all. The game will continue to run on the Xbox One platform. Xbox 360 and Windows 10 players have seven days to migrate their Happy Tickets to the Xbox One. •5:00 am Thursday, March 15th, 2018 (EST) - Happy Ticket migration services will no longer be available on all platforms. •8:00 pm Wednesday, April 11th, 2018 (EST) - Save data sharing on all platforms will no longer be available. Happy Tickets will no longer be available for purchase on Xbox 360 or Windows 10. •8:00 pm Wednesday, June 14th, 2018 (EST) - Happy Wars will be removed from the Xbox 360 and Windows 10 stores. In-game Events will no longer occur on Xbox 360 and Windows 10. •7:00 pm Monday, December 17th, 2018 (EST) - Service for the Xbox 360 and Windows 10 versions of Happy Wars will shut down.